People think, talk, and walk around. Plants do none of these things. So how can they be anything like us? Well, writes Bridget Heos, they can communicate with each other and wear sneaky disguises. And plants even wage war. In this addition to her “Just Like Us” series, she gives us an up-close look into the secret – and not so secret – lives of plants. 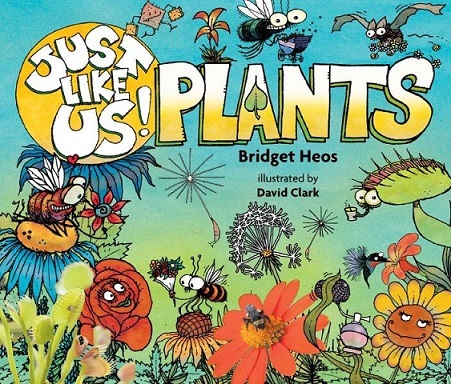 What I like about this book: On each spread we get to see one specific way in which plants are similar to people. One spread focuses on what plants eat, another on the importance of drinking water. There are a couple spreads that detail how young seeds are sent on their way – some by hitching a ride, others by air or sea. David Clark’s vibrant and humorous illustrations are fun and engaging. A glossary and bibliography provide more for the curious kid.